I think we all experience this once in a while don't we? For a couple of months I’ve been experiencing what I can only describe a mid-century wobbly (I hit the big 5-0 next year) and the joys of the raging hormones that come as part of that particular package! At times I haven’t recognised myself…..I’ve always felt I’m a happy-go-lucky confident, optimistic, glass half full-type so it’s been a bit of a shocker to have experienced such a loss of confidence. At times I’ve felt tearful, anxious and completely overwhelmed by day to day things. I put on little weight, so I didn't feels happy in my clothes. I don’t think Instagram has helped to be honest as I’ve found myself comparing myself to others and I've been guilty of trying to keep up with the Jones’s. It got to the point that I felt I'd totally lost touch with why I started to do this in the first place. I’ve always loved sharing my everyday outfits. I’ve always enjoyed sharing my High Street finds…..I do so love a bargain! But I've felt like I've lost touch with the very things that gave me joy when I first started on this blogging journey. At the moment I’m very aware of all the ‘stuff’ I have accumulated and so I’m in the midst of a huge wardrobe cull, much of it being recycled via eBay. Many things I bought and loved last year just don’t feel me anymore so I’ve whittled my wardrobe down to a few favourites while I try and figure my style out again. I hope you’ll bear with me….I’d really love to hear from you if you’ve found yourself feeling the same. If you have any tips or remedies that have helped you through the menopausal collywobbles, please share! I’ve found opening up to friends about how I feel has really helped and it I thought if I could help just one person by writing this down…..well that would wonderful! 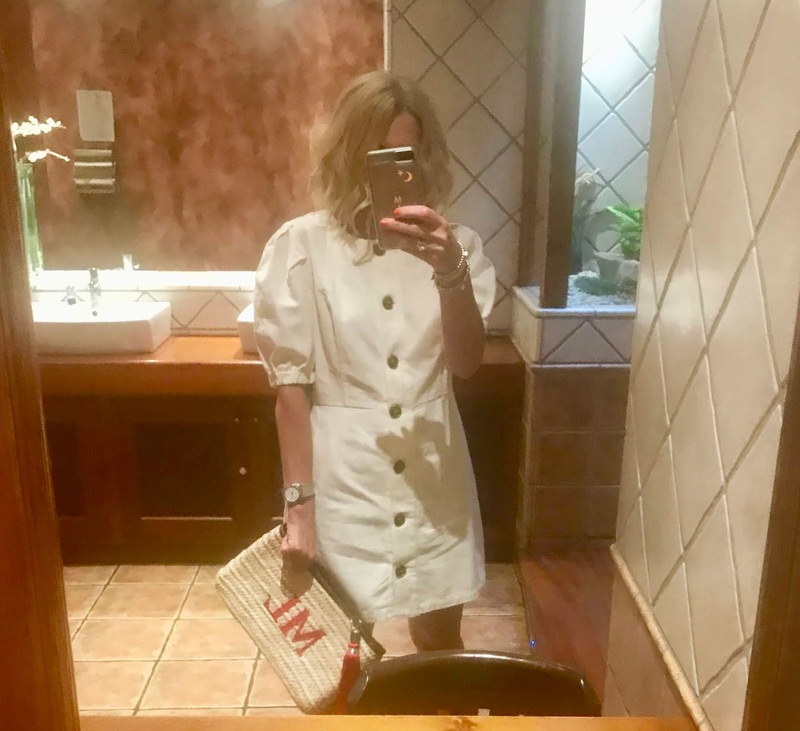 To get back in the saddle blog-wise I thought I'd share a few of the outfits that have been making me love my wardrobe again. If you follow me on Instagram you'll know I've been on holiday this past week. I made a couple of pre-holiday purchases......and thanks to a large branch of Zara in Puerto Del Carmen where we stayed in Lanzarote I had a few holiday treats as well! This outfit was an absolute winner when I posed it on Instagram. I love the Topshop cami and will be scouring the High Street for similar. I adore the trousers, these were a holiday purchase and I've no doubt you'll be seeing these on repeat. #ihavethisthingwithwhitedresses Yup....evidence of my obsession with cream/white dresses.......especially from Zara! I have also developed a bit of a thing for Urban Outfitters this season! And one last look......also a holiday purchase from Zara. Just in case you want to see what I travelled in, I wore this jumpsuit. 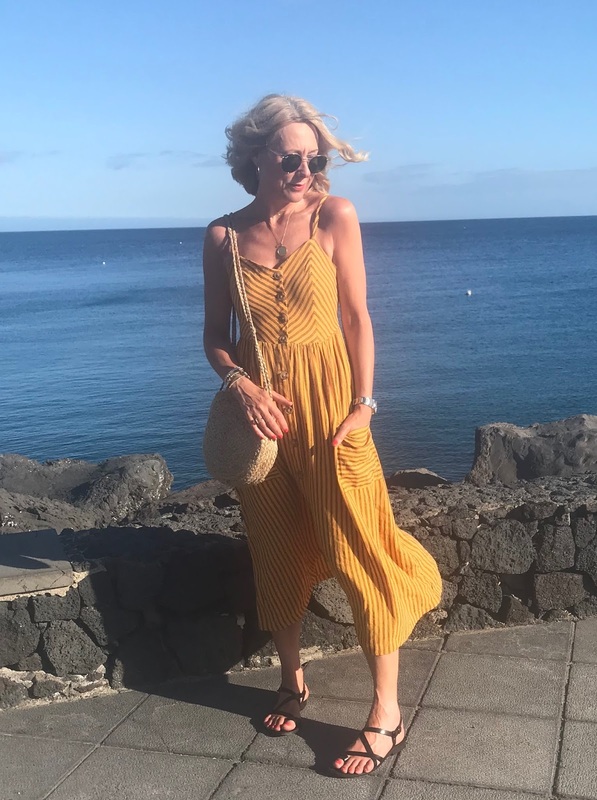 When I wasn't in my denim cut off's and a cami poolside I found this playsuit was brilliant for slipping off and on over a bikini.....I'm quite tempted to buy it in another colour for our next holiday in August. So there you go.....one mojo restored. I hope to start regularly posting blog posts again regularly, please do let me know if there is anything in particular you'd like me to blog about.....it might be just the thing to cure the writer's block! I've just turned 48, so I can completely identify. Following a long weekend in Italy with my sisters and mum I am suffering a bit of a crisis of identity and have decided to take myself in hand a bit. I know ageing causes changes to my shape, but that doesn't detract from the fact that I've not been eating as well as I should and am doing something about it. Aside from an overwhelming desire for chocolate cake, it's not been as hard as I thought it would be and I feel better for it (and I'm sure the cake will creep back in, just in lesser quantities). Love your Zara white lacy dress and may just have to scour good old ebay for one. I think your mojo is well and truly back - you've looked super lately (even more than usual). Age ain't nothin' but a number! Aww Marie....I reckon chocolate cake is a very reasonable cure for anything wobbly-related! I hear you though, I've had to cut back on the treats and I'm trying to cut out alcohol altogether as I have a feeling that's one of the worst offenders if you are having any kind of mood swings.....it's empty calories too when I'd rather have the chocolate cake! You are absolutely right in that age ain't nothing but a number.....sometimes we need to remember to be kind to ourselves and not beat ourselves up so much about stuff. I've been following you for a long time and thought you had been quiet. Sorry to hear about your wobble. I'm so glad you're back, I've been following many insta stylists and have to say I've totally loved your edit here. So nice to see something new! Your outfits look stylist, simple (and are affordable! ), very inspirational, love the Urban Outfitters gear, and the playsuit - thank you - off to have an online browse! That resonates with me so much - I hit 50 this year and I am really struggling with identity generally. I'm not brave enough to cull my wardrobe - I haven't quite let go of my past yet! But I feel inspired to carve out time for it now as I'm feeling the weight of it... 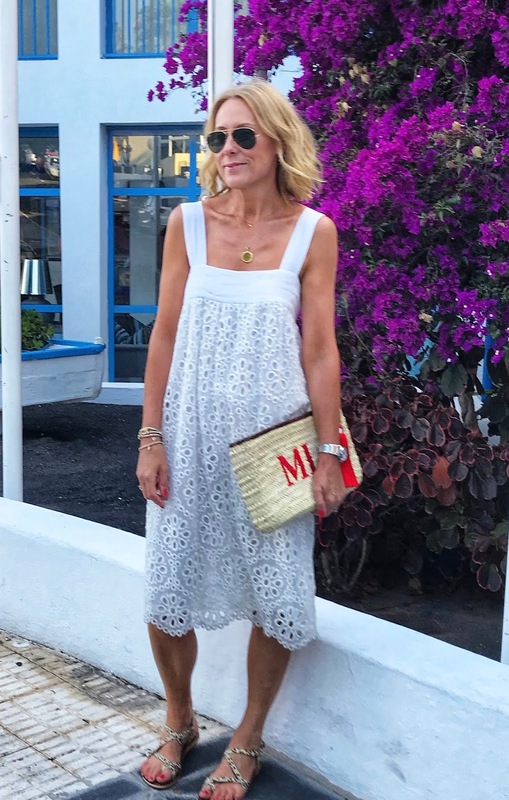 I always enjoy the limited wardrobe a holiday brings ;) I did, handily I now realise, get the big M out of the way with an early one in my early 40s - my advice would be kind to yourself (and stay away form anyone who isn't kind to you!) and like everything else, this too will pass. Love the post and ordering the jumpsuit and playsuit for our three week camper van adventure to Italy this summer! Hey lovely, so good to hear from you! There are so many echos here of the things we discuss about Instagram and the way people portray their lives. That's why I felt it so very important to explain why I've been AWOL from the blog as things are not always as they seem. Something had to give and I found it hard to cobble together a caption for an Instagram post....never mind having to write a whole blog post! I had to remember what gave me the joy when I started along this path and that's what I'm grasping again now. You are so right.....I absolutely crave to see more relatable, realistic and honest accounts, that's what I always loved abut Avenue 57 in the early days, it was such a supportive place. Yes re: brain going - I am having terrible memory problems and brain fog. On bad days I am convinced I have dementia! Gosh Lorraine, so sorry to hear you had such a rough time with it, I am well aware that what I've experienced so far could be just the tip of the iceberg! Your attitude about it is great though, I think you've hit the nail on the head by saying you have to accept where you are....basically on the cusp of another life change and really it should be celebrated! Hopefully I will care less about what other people think about me......now that'll be worth raising a glass to! Hi Michelle. Good to read this... good because getting it off your chest is good for you! All that you have written highlights all the more that you are human - like the rest of us and we’re in this together. I'm 52 and have felt exactly like you have been feeling. Just remember that phrase from LORD OF THE RINGS and adapt it to your convenience, "This too shall pass", then turn it into a mantra Pre-menopause and menopause are like a second adolescence, your body is changing and that's why somedays you don't feel like yourself but just like when you were a teenager the anxiety, fear, confusion, etc. are temporary. So glad you are back!! I think I got off fairly lightly with the menopause (apart from it starting at 42!) but I do still suffer with brain fog sometimes. I lost my mojo recently too, but I found it again by abandoning all attempts to embrace the 'new straight leg jeans' silhouette (I felt sooo frumpy) and treating myself to a new pair of Topshop Jamies! Shallow I know, but I felt like me again. Looking forward to more posts. a little update on the big M! the high street rises to the occasion!